Come and experience the Magic of Christmas in Thomastown on Saturday December 2nd and Sunday December 3rd, 2017. 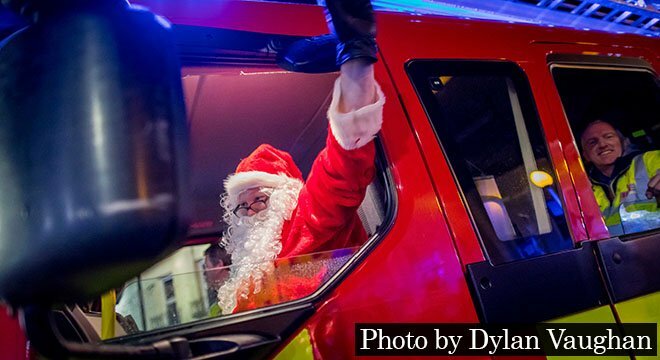 Thomastown Community Network is arranging its second ‘Christmas in Thomastown’ weekend, with the Light Parade and the arrival of Santa in his Magical Fire Engine. Saturday December 2nd will be ‘Shop Small Saturday’. Shops will be stocked with special Christmas gifts, while cafés and restaurants will have edible seasonal delights. Enjoy the Christmas shop windows decorated specially for the annual Christmas Windows competition. Businesses are encouraged to also put out Christmas trees, to enhance the festive atmosphere. Proceedings on Sunday December 3rd will open at 12 noon with The Watergarden’s Advent Fair (Camphill Communities). There will be stalls selling crafted gifts and food in the magical fairy-like water garden setting until 5 p.m. The Fair will be followed by The Parade of Light through the town. Meet at The Quay car park at 4.45 p.m. and bring your own lanterns to light up the town and follow the parade led by the Scouts. Wear Santa hats and Christmas jumpers too, if you have them! Santa himself will then turn on the Tree of Light and all the other Christmas lights of Thomastown. A children’s Christmas movie will follow in Thomastown Community Centre at 6 p.m. It promises to be a great weekend as we bring Christmas to Thomastown this year. See you there!